... (or team). I know, I promised no more baseball posts for a while, but this is just too good to resist. I never thought I'd say it, but I'm actually beginning to feel sorry for the Yanks. Not, mind you, sorry enough to want them to win this weekend's series with the Red Sox. 6/10 update: When I looked at this post the morning after committing it to the ether, I felt a nagging sensation that I ought to delete it. A couple of days ago sydbristow (see "comments" below) pointed out that, since I posted, the Yanks had won five straight (it's now six). He tactfully did not add that the Mets have gone into a vertiginous tailspin. Ye Gods! Forgive my presumption. I will never say I'm sorry for the Yankees again. they [the Yankees] have dangerous bats, but apparently streaky ones. and still don't have trustworthy pitching. Hmmm ... what other New York team fits that description to a tee? ... someone in Mountain View, California who got here by way of a Google search for "Eisenhower Locks map". Massena, New York is a long way from California. I hope you enjoy the trip. Google searches, you were actually able to get what you were after by following one simple link from my blog. I'm tempted to say that should be reward enough, but, seriously, if you happen to read this and if your travel plans ever include New York City, I'll be delighted to buy you a drink (or, if you're off the sauce or just not in the mood, a genuine Brooklyn egg cream - if you're allergic to eggs or lactose intolerant, no worries, as it contains neither egg nor cream). Bite (see "comments" below) asks: How do you know the city and town the guy was from? If you scroll down to the bottom of my blog, on the left side of the page you'll see a button that says "Sitemeter". Double-click on that, and you'll get a list of the last twenty visits to the blog. In most cases, as you can see, the list includes the location from which the hit came. Some computers are cagey and only disclose what country they're in, some others simply say "unknown". I'll admit that there's some uncertainty over the actual location of my 5,000th visitor. The Sitemeter says "Mountain View", but I get an awful lot of hits from that location, which suggests that there may be a large corporate server (or two or three) there that serves a number of locations. For example, if I were to visit someone's blog using the computer in my office, which is in lower Manhattan, and that blog had a Sitemeter, my hit would be shown as coming from Philadelphia, because that's where the central server for the firm is located. So, when I say my 5,000th visitor was from Mountain View, I'm really making a semi-educated guess based on the best information I have. What I really don't know is that this visitor was a guy. On weekend mornings, I've gotten into the habit of walking to the north end of the Brooklyn Heights Promenade, then down Squibb Hill, across Old Fulton Street and under the Brooklyn Bridge to the Empire-Fulton Ferry State Park. 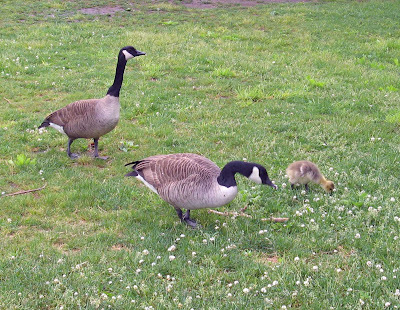 There, I've been encountering this trio, usually near the south edge of the Park, next to the east tower of the Bridge. 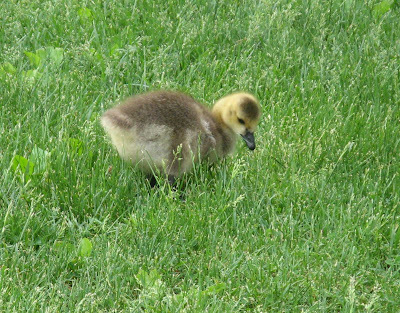 Here's a close-up of the young 'un. A while back, I posted about a small vessel that made what was heralded as the first solar powered crossing of the Atlantic. Now, New York institution Circle Line has announced plans to put a solar powered ferry into service on its enormously popular Battery Park to the Statue of Liberty and Ellis Island route. 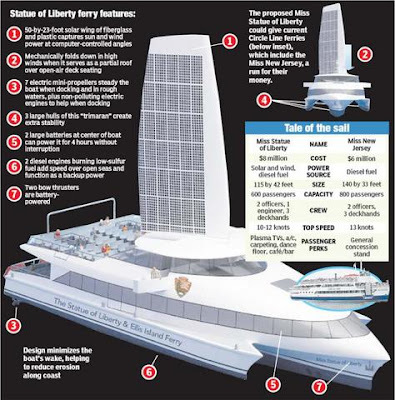 Below is an image (from the New York Post, via Tom Turner of NYC Maritime) of the proposed vessel. In my earlier post, I noted that sailing vessels could be said to be "solar powered", as wind is created by solar energy. The Circle Line design makes use of wind as well as solar cells, by placing the cells on a rigid "wing" that stands above the vessel like a sail and can be rotated to secure maximal wind assistance. There is also a "cheat" to reflect commercial reality: auxiliary diesel engines.